Alan Stubbs has added the forward to his squad for next season's Championship tilt. 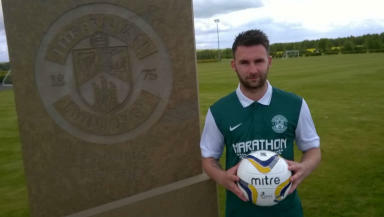 Hibernian have signed James Keatings just days after the striker left Hearts by mutual consent. The forward left the Tynecastle club on Friday after just one year with the Championship winners. However, Keatings has now signed with Hearts' Edinburgh rivals Hibs as Alan Stubbs strengthens his squad ahead of a title challenge next season. The 23-year-old started his career at Celtic, spending two loan spells at Hamilton and St Johnstone, before joining Hamilton on a permanent deal in July 2013. He played a pivotal part in getting Hamilton to the Scottish top-flight, scoring 13 goals and winning the Championship title. Hearts signed Keatings for last season's Championship campaign, but struggled to hold down a starting place at Tynecastle, scoring 11 goals in 33 appearances for the Jam Tarts.